A while ago a thought came to my mind: Where have all the "MK people" (Mong Kok people) gone? The so-called "MK style" was oft-mentioned five years or so ago, but it suddenly disappeared. The emergence of a narrative of "mainland style" at the same time suggests that it has replaced the city's former concerns about the MK style. First, let's consider what MK-style is. People in Hong Kong refer to a certain manner of dress as "Mong Kok-style", more commonly abbreviated by the acronym "MK." Mong Kok, of course, is one of the city's thriving shopping and eating centers in Kowloon. It's also one of the most densely populated neighborhoods on the planet. As a residential area it houses some of the oldest and poorest Hong Kong residents; as a commercial area it caters to the consumption needs of the lower middle-class, including students and teenagers, who earn little. The term Mong Kok-style can be used for many different things. It is about the way you dress, style your hair, move and speak. "In this absurd trend," a blogger says, "bisexual young men groom their hair in a combination of mullet/comb-over, dress and apply makeup to imitate hedgehogs and pubic hair, and chain-smoke even if they hate tobacco. They wear tight, dark-colored trousers, numerous small silver necklaces, earrings, and bracelets, a fake leather jacket, and most importantly, a black shirt with white-lettered English slogans that don't make any sense. This style suggests a continuing love of things foreign. Strangely, no foreigner is actually doing things like this." To my amazement, the term even earned itself an entry in the online "urban dictionary", which describes it as "of or related to the styles, community, culture, or behaviors of Mong Kok, a Kowloon neighborhood in Hong Kong known for the alternative crowds it attracts such as punk, hipster, Goth, and other non-traditional subcultures. The neighborhood is often compared to Harajuku in Tokyo or even a Williamsburg, Brooklyn, NYC." Examples of sentences using the term MK is also provided in the "urban dictionary", such as "Standing outside the MTR station while smoking and playing with your handset is so MK." People who pretend to be pluralistic and open-minded insist that MK-style can have negative connotations as well as positive ones. I take that as meaning practitioners of the style like it but non-practitioners do not. If the boundary between the MK-style and the mainstream local culture is demarcated by class, the narrative of "mainland style" - highlighted by examples of children urinating in the public and other "uncivilized" demeanors exhibited by mainlanders - assumes a single, unified "Hong Kong-style." With mainlanders possessing all the "otherness", our internal differences no longer matter. Unfortunately, the mainlanders cannot escape the same kind of reasoning. They are calling their poorer cousins "shamate", a transliteration of the English word "smart". 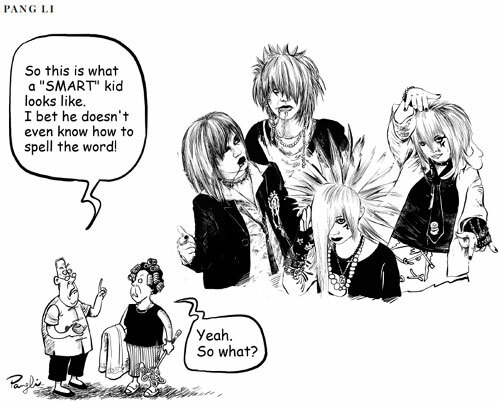 But while smart means stylish or clever, shamate is used as derogatory term, referring to young people from rural areas "with weird hairstyles, weird clothes, heavy makeup, and a strange attitude." Both Hong Kong residents and mainlanders believe that there is a hierarchy of styles. 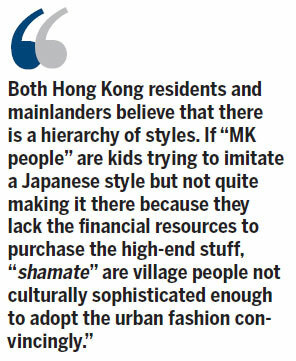 If "MK people" are kids trying to imitate a Japanese style but not quite making it there because they lack the financial resources to purchase the high-end stuff, "shamate" are village people not culturally sophisticated enough to adopt the urban fashion convincingly. Zhang Tianpan wrote in Nanfengchuang, a Guangzhou-based magazine, saying that the style of shamate is "the result of the semi-urbanization and incomplete modernization of individuals and groups". In other words, this group of people is too poor or stupid to acquire the "ultimate style", whatever that maybe. If we are to believe people like Zhang, the less well-off youth are either not aware of the mainstream culture, or something went wrong in the process of them acquiring the mainstream fashion. In fact, things went badly and mysteriously wrong, turning what would have been a Korean style into 1990s punk. It has never occurred to Zhang that rural youth might have preferred the masculine punk look to the gender-neutral Korean look, and there is nothing inferior with this preference. We should not be talking about one culture and its degraded variants, but different cultures equally "modern" and "urban". The good news is, if Zhang comes to Hong Kong, people here will welcome him as just another person having a "mainland style." The author is a current affairs commentator.